Cleveland is home to the nation’s second school voucher program, which allows families to use public funds to attend private and parochial schools, even some outside the city. “The fact was people were choosing, and we had to get into the market so people would choose us as well,” says Gordon. Mayor Frank Jackson was a driving force behind the plan, and he outlined to the public the need for drastic improvements in the district. After legislators were convinced to take action, Ohio Governor John Kasich in 2012 signed into law Cleveland’s Plan for Transforming Schools. The district moved to a portfolio model, based on research by the Center for Reinventing Public Education (CRPE). The Cleveland Plan outlines an agenda to provide school choices driven by demand, improve test scores and graduation rates, create more high-performing schools, and closes failing schools. While Gordon says there are opponents of the portfolio model, which has been around for 20 years, it suits CMSD well. “There are critics of the portfolio model who argue that it’s not fully research-based,” he says. “But we had a model for years and years that wasn’t working.” The portfolio model provides a variety of school options and choices to suit each individual student’s needs. The nonprofit Cleveland Transformation Alliance was created in 2012 to execute the Cleveland Plan and monitor the district’s progress toward reaching its goals. The Alliance, a collaborative partnership between CMSD, charter schools and nonprofits, aims to make sure CMSD students get the best education, suited for their needs, in the best schools. The Cleveland Plan ultimately will eliminate the system’s failing schools, improve test scores and graduation rates and implement system reforms across the board. This past June, the Transformation Alliance released its first Report to the Community on the Impact and Implementation of the Cleveland Plan – tracking the progress made since 2012, looking at long-term goals and making recommendations for continued improvements. The report is based on the most recent data available -- from the 2013-14 school year. Data from the 2014-15 school year data should be out in January, and the Alliance will issue another report then. The Alliance plans to continue to issue progress reports as more data becomes available. The Alliance’s report indicates that while some progress has been made in improving the schools, there is still a long way to go. The infrastructure is in place and there are already signs of better management, better grades and better schools overall. While it may have taken some time to get rolling, conditions are now right for some faster changes. Here are five main takeaways from the report. Before the Cleveland Plan, schools within CMSD were controlled by a central administrative office, which coordinated staffing, scheduling, curriculum, operations and budgets. This method left the individual schools with little control over what they needed to implement programs, and no ability to hire the right teachers to meet student needs. The central office was literally distanced from the day-to-day operations of schools. “It left very little decision-making capacity at the individual school,” says Piet van Lier, the Alliance’s director of school quality, policy and communications. The autonomy has resulted in some unique alternatives, such as Campus International School, which is Cleveland’s only international baccalaureate school. 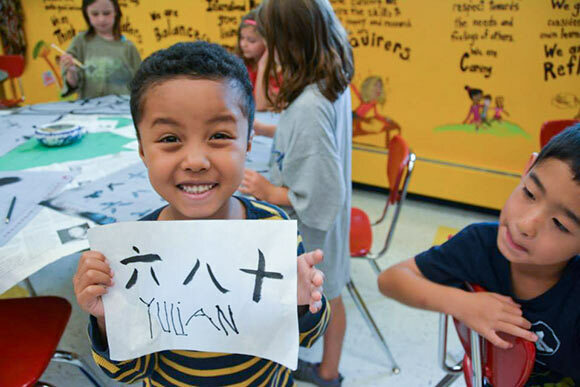 Located on the Cleveland State University campus, the school teaches Mandarin Chinese to all students. This year Campus International houses students in kindergarten through seventh grade, and will add a grade each year until it runs through high school. Another example is Tremont Montessori, which takes the Montessori approach in Pre-K through eighth grade, and Paul L. Dunbar School, which has begun incorporating an arts-infused curriculum. When Principal Sofia Piperis took the leadership reins last year, the school was using an enrichment model of learning to encourage critical thinking among a small group of gifted and talented students. Piperis soon found that the model worked for the entire school but the students needed more engagement to get excited about learning. So she switched the model to the arts – from the visual arts to dance, music and writing. She took her student-based budget and, working with the Progressive Arts Alliance, implemented a 10-week program that combines sciences with the arts. “We want our students to become engaged in learning,” explains Piperis. “We want to encourage lifelong learning.”Dunbar also received grants to help fund the curriculum. The school autonomy allowed Piperis to implement a curriculum most appropriate for the Dunbar students. The goal of the Cleveland Plan is to triple the number of students enrolled in high-performing schools and eliminate failing schools by the end of the 2018-19 school year. While the latest numbers show an 11 percent drop in the number of students attending schools deemed “high performing,” there was also an 11 percent drop in the number of students in failing schools. Mid-performance schools saw a 39 percent increase, while low-performing schools saw a 29 percent increase. An additional issue with reports reflecting any improvements is the fact that the Ohio Board of Education has changed its assessment methods three times in three years. As the assessments have become increasingly stringent, the improvements in test scores and graduation rates may not be as obvious. Improvement could show up as early as the upcoming school year. CMSD identified two low-performing K-8 schools – Buckeye-Woodland and Paul Revere – for closure at the end of the upcoming school year, and is phasing out SuccessTech High School. 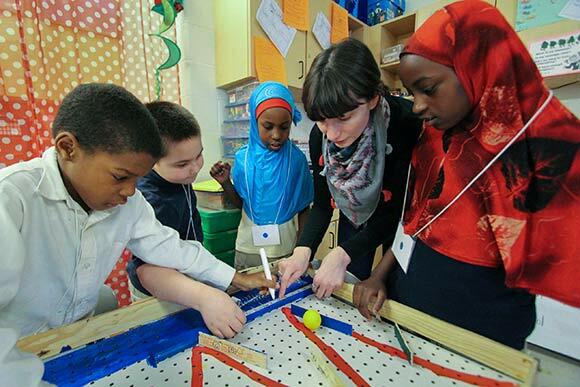 In the 2013-14 and 2014-15 school years 23 of CMSD’s poorest performing schools were targeted for corrective action and added investment -- using an intensive community wraparound strategy that is supported by United Way of Greater Cleveland and in partnership with local service agencies. The wraparound strategy includes services like academic supports and enrichment, family engagement, parent leadership and adult education, year-round enrichment programming, access to social services and life skills training. Six charter schools have also been closed for academic or financial reasons. The CMSD has added five new high schools and added grades and seats at some of the high performing school since 2012, and four new charter schools have been created based on high-performance models. That collaborative approach has resulted in some unique partnerships. For instance, Near West Intergenerational School, one of the top-rated K-8 schools in Cleveland, operated for several years out of Garrett Morgan. Near West was the first charter school in Ohio to be co-located in a district school. Now the school leases space from CMSD in the old Kentucky School next door to Garrett Morgan. And, starting with this school year, Citizens Academy Southeast is co-located in the south wing of Whitney M. Young. Under CMSD’s open enrollment policy, parents and students can choose any school within the district. The idea is to get students into schools that best meet their needs, as opposed to the ones closest to their homes. Those charter schools that partner with or are sponsored by the CMSD only add to the portfolio approach to developing a good school district, says Alan Rosskamm, CEO of Breakthrough Schools and Alliance board member. 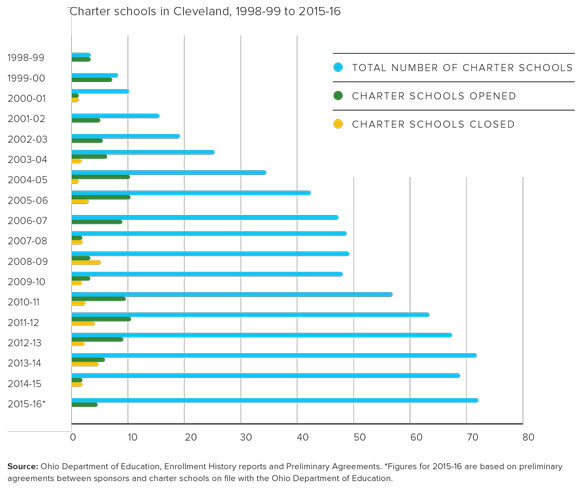 Breakthrough touts the highest-performing performance record among Cleveland charter schools. The charter schools under the district umbrella receive a portion of the tax levy money collected from property taxes and their performance numbers are included in state reports. “What is unique about Cleveland and unique about the Cleveland Plan is the strong collaboration with the district and charter schools,” Rosskamm says. The cooperation between CMSD and the charter schools is so unique it earned the district a $100,000 one-year planning grant from the Bill and Melinda Gates Foundation to expand the number of high performing schools in the district. The grant will also help improve education for special needs students and students who are learning English. The Alliance plans to push onward. “With the end goal of ensuring that all Cleveland children can attend quality schools, the Alliance’s top priority is making sure that all stakeholders intensify their work toward that goal,” says van Lier.